On their holy special day. Can't you hear that rumbly sound?" Shabbat is our sabbath, our weekly day of rest. It's a lovely time, a special time. A day of the week to hang out at home, go to the park, visit friends and relatives. If you don't have a day like that in your life, maybe you should. But the one thing you should know about Shabbat: it has nothing whatsoever to do with monsters. Did you ever have a book that seemed to write itself? This book was like that. The verses came and came, until - soon - there was a book full of them. And it was perfect, or nearly so. I mean, it needed editing, some of the rhymes were rough, but I was excited and proud. I read the words to my son, who loved it. He "got" it. He knew without saying anything that it was about him and his problem making friends. Over the next week or two, I polished up the story until it shone. Really, shone. And I emailed it off to an editor with a Jewish kids' publishing company. Have you ever done that? Sent off a story you love to an editor... just hoping she'll be kind, if not exactly merciful? And then - she got back to me! I was so excited. 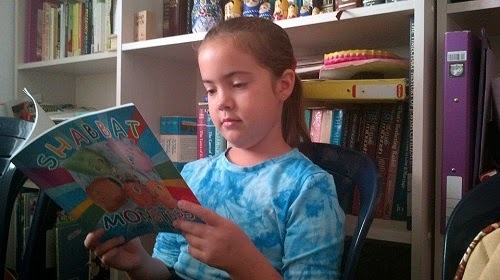 She liked the title, liked the rhymes, and suggested I incorporate more Shabbat elements and resubmit. So I did. Again, I wrote, I polished. It was perfect. It shone. And I emailed it off again. Hope hope hope hope hope... splat. She read it. And bounced it right back with the comment, "A picture book for little ones requires a single theme, either Shabbat theme or bullying theme, not both." 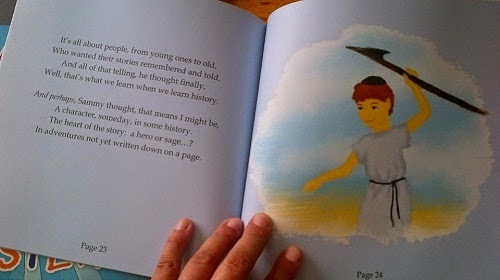 The book isn't intended to teach kids about Shabbat OR about bullying. There are lots of books like that out there. This story is for kids who have Shabbat already; who, like the Shabbat Monsters in the story, enjoy it as a cherished part of their weekly routine. And for kids who sometimes feel excluded - and really, who doesn't? I'd never thought that the two ideas didn't belong together. I mean, here they were, coexisting very naturally in the life of my 6-year-old son, who can't get together with friends on Shabbat because the neighbourhood kids don't know how cool he is (and how many fart jokes he knows!). In fact, I believe that combining these two themes is exactly WHY the story works. De-emphasizing both of the "topics" means that neither of them comes across as all that big of a deal. Shabbat... just is. And bullying... just is. I wanted a story that was fun and light, not a deep, heavy exploration of either one. So I blew a proverbial (and metaphorical) raspberry and got to work publishing it myself. Holding it in my hands. Yesterday, my proof copies of Shabbat Monsters arrived in the mail from Createspace. And I fell in love with this story, with this book, all over again. It's been a slog, and rejection is never pleasant. But I think, in the end, that editor's rejection has made the book better by strengthening my resolve to self-publish. Sure, I could have run with the manuscript, from editor to editor (there are a few Jewish publishing companies out there that publish for kids). Explaining the story better, encouraging them to reconsider, rewriting it to meet their exact specifications. Or I could publish this story myself. For my son, and for the other kids I hope are out there who are like him. You don't have to be Jewish or keep Shabbat to enjoy this book. Heck, you don't even have to be fuzzy, blue, or have only one eye. 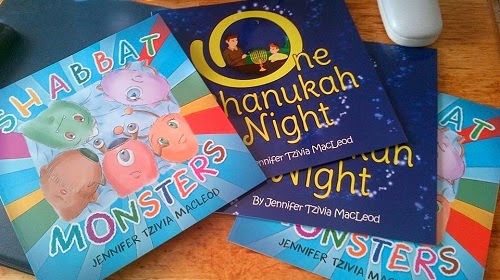 There's a Shabbat Monster inside us all... and self-publishing has helped me get this one out into the light of day. What's stopping you from telling your story, your way? If you're holding back out of fear that editors will disapprove or your story doesn't have a market... maybe you should unleash it on the world - and let the world decide for itself. p.s. Someday I'll tell you about the slog I've had getting my Chanukah book ready for publication. It came yesterday, too, and I am very, very happy and proud of them both. Text and illustration from One Chanukah Night, by Jennifer Tzivia MacLeod. If you've been rejected by an editor and gone on to self-publish successfully, I'd love to hear about it in the comments or via email. Give me some hope that my book will find its audience! It all seemed such a long and unwieldily process - putting the control of your pride and joy into the arms of another. One who just doesn't share the Heart and Soul element that has been poured into the story. So, just like you, I did a bit of research and went on to publish myself. I raised money on Kickstarter - so I could prove to myself that my story had a potential following out there, and crossed my fingers and toes that it did. IT DID!!! And $6,000 later I published my first book. I'm now planning my second Kickstarter campaign for book 3 of my six-book series - which will happen in September. This is a fantastic way of doing things, and one I wholly recommend to you! Best of luck with Shabbat Monsters and One Chanukah Night! Getting through the gatekeepers can be so frustrating. It's not their fault, really; they're just totally, totally swamped. I'm so glad that you had success with Kickstarter. Usually, that only happens if you have a significant following of your own, so clearly, there are people out there excited about your books, too. Good luck with them! Excellent post. We have had a bunch of fun with self-publishing. It is lovely to have so much control about the final product. Congratulations on both of your books! We are hopping along the #KidLitBlogHop. It's totally empowering, but just a little frightening, too, don't you think? Like, all the "what ifs" and the feeling that maybe a "real" publisher could do it better. But the quality of self-published books is improving all the time, as we learn to do for ourselves what publishers have always said only they can do for us. Thanks, Dawn. I really share it here not just to brag but to let other people know that editors are not perfect or omniscient. Self-publishing doesn't have to be seen as a "second best" option. I appreciate your stopping by! Love your post, Jennifer! Thanks for sharing your path and adorable books! Looks like a really cute book! I, too, have paid my dues with rejections (admittedly, mostly with books that deserved it), but my first (published) book hit that same junction of self-publishing being ready for me, and me being more interested in sharing the book than in the validation that traditional publication would give me (though I'll not lie; I'd love to be validated that way, because you know, we are all insecure!). I'd like to try shopping an MS around again, but I am kind of addicted to the fast results from the DIY model. Yeah, it takes a year to get the MS and the cover and everything all together, but once I'm satisfied, it takes DAYS to get a book in my hand! 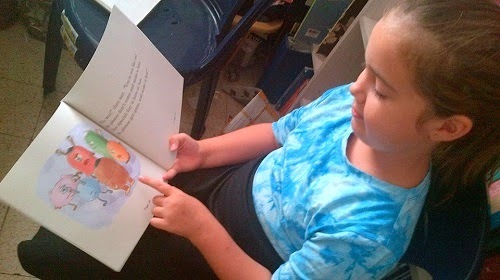 Jennifer, thanks for sharing your story on the Kid Lit Blog Hop!